I'm especially motivated to tell you about this in hopes that some of you have created artwork related to my own books, of course, but this is a fun opportunity for any reader who has been inspired by an indie author. It's really easy to find artwork inspired by best sellers or books that have gotten movie/tv deals, but the less known authors often have awesome worlds that look great in a visual medium. Do you like to draw, paint, or sculpt? 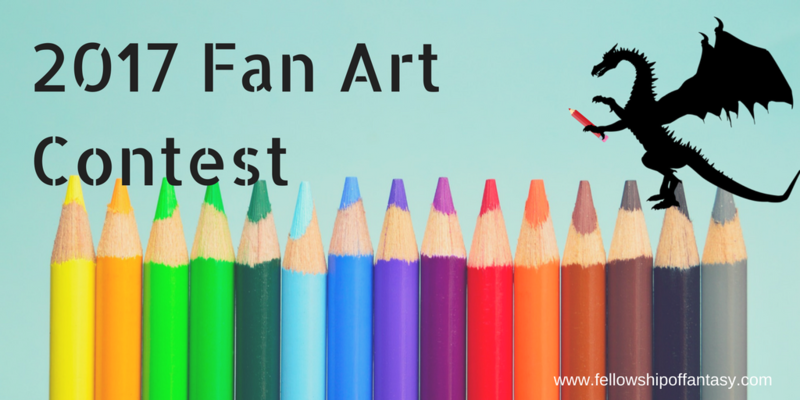 Have you read a book by a Fellowship of Fantasy author and been inspired to create art? Here’s your chance to show it off to our page followers … and maybe win an awesome prize. Announcing the 2017 Fellowship of Fantasy Fan Art Competition! To enter email a scanned copy or photograph of your artwork as a PNG or JPEG file to hlb@hlburkeauthor.com. Name of the book the art represents. Age of the artist (or what age category the art should be entered if if you would rather leave off your exact age. The three categories are 16+, 11 to 15, and 10 and under.). Verification of your contact email address. The winner of the 11-15 age category will receive a Fellowship of Fantasy mini-library consisting of 5 paperback and 8 ebook fantasy titles (ebooks will be substituted for a non-US winner due to shipping costs). The winner of the 10 and Under age category will receive a mini-library of 5 paperback titles as well as a colored pencil set (digital prize such as an Amazon gift certificate may be substituted for non-US winners depending on shipping restrictions to the winner’s location). While artists maintain the right to the artwork, the artist entering their work in the contest gives us license to post the work in our public feeds and use the image in promotional materials if desired. Art must depict characters/scenes from an Indie fantasy author. Not from an IP controlled by a major publishing house or corporation. Winner will be chosen via social media likes. There will be three winners selected, one for each age category (16+, 11 to 15, and 10 and under). Commissioned artwork is disqualified from the contest. This does not disqualify artists who have sold other artwork, just they cannot have been paid specifically to create this artwork for the writer (so no cover art). The art needs to be easily represented in a still image or by photographic means. Sorry no videos, performance art, or written word pieces at this time. Inappropriate art or art deemed insensitive or inappropriate for our audience may be disqualified at the contest runner’s discretion. Authors may not submit art directly related to their own work, though they may submit art related to the work of another author. Children, spouses, friends, relatives of authors are free to enter even if the art is related to that author. Art must be original work, submitted by the artist or the legal guardian of the artist if the artist is a minor. The submission period runs from August 14th through September 16th. All eligible submissions will be posted on our Facebook page (www.facebook.com/fellowshipoffantasy) for readers to admire and to vote using their “like” buttons. Winner determined by social media response October 1st. Are there any particular books for artists to draw from? Or is this "anything so long as it's indie"? Any indie ... preferably fantasy since that's the "brand."